Seth Frantz won by a fall in 5:03 vs. Justin Knipper in the heavyweight match at Beavercreek. 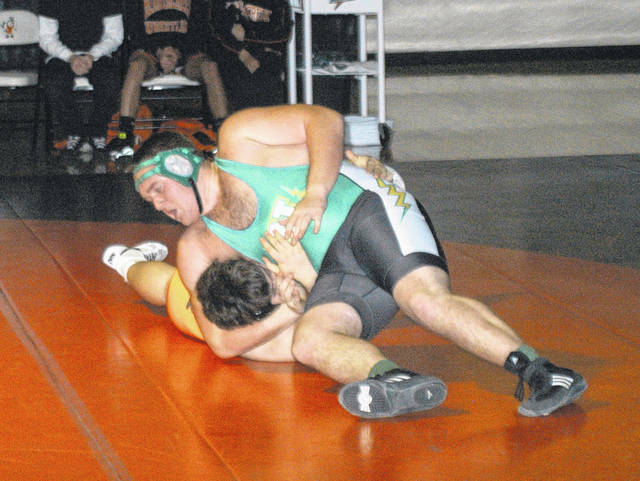 BEAVERCREEK — With a snow storm looming to hit the Miami Valley the Northmont High School wrestling team couldn’t weather a Beavercreek team Friday night that overpowered the Thunderbolts 55-12. Both team forfeited at 106 pounds while Northmont also had to forfeit matches at 113, 120 and 126 pounds. In the 132 pound match Justin Weckler (Beavercreek) scored a 7-6 decision against Miles Moyer. At 138 Jacob Pfander (Beavercreek) won by a fall in 3:05 vs. Christian Powell. The 145 pound match saw Garrett Golden (Beavercreek) win by a fall in 4:43 vs. Mason Sigler. Northmont got its first win at 152 where Andrew Knick won by a fall in 2:40 vs. Ian Baird. At 160 Alex Canida (Beavercreek) scored a 15-6 decision vs. James Wilson. The 170 pound match saw Jordan Dillon (Beavercreek) win by a fall in 3:47 vs. Jackson Clark. At 182 John Hammond (Beavercreek) won by a fall in 56 seconds vs. Billy Mengerink. In the 195 pound match Austin Stevenson (Beavercreek) scored an 8-4 decision over Phil Tracey. In a controversial 220 pound bout that went into overtime Bradley Smith (Beavercreek) scored a 3-2 decision over Bryan Heyward. The heavyweight match saw Seth Frantz (Northmont) win by a fall in 5:03 vs. Justin Knipper.